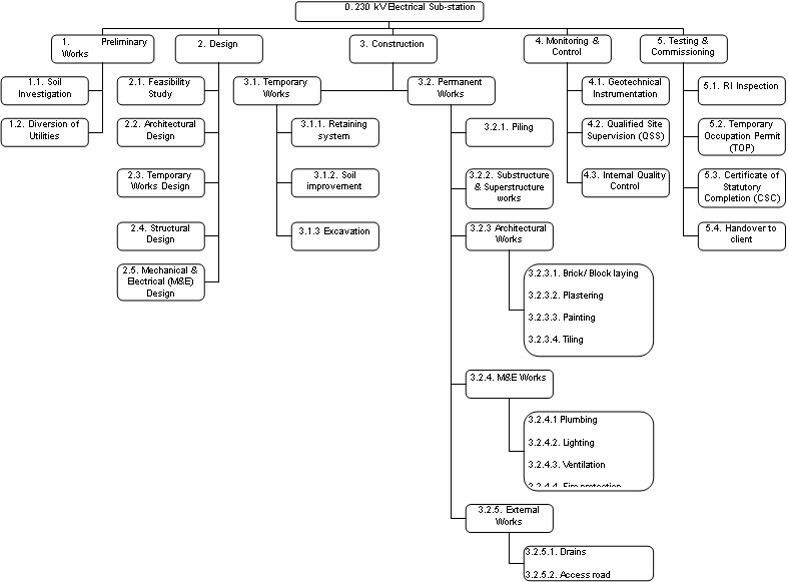 The Work Breakdown Structure (WBS) is a hierarchical decomposition of the total scope of the project. While creating WBS, we sub-divide the project scope into smaller, more manageable components. Each descending level of WBS represents an increasing level of details of the project. The lowest level of WBS are known as work packages. The decomposition in WBS happens to the level for which cost and duration can be estimated and managed. Adequate care should be taken as excessive decomposition might lead to non-productive management effort, inefficient use of resources, decreased efficiency in performing the work and difficulty in schedule and cost estimates. 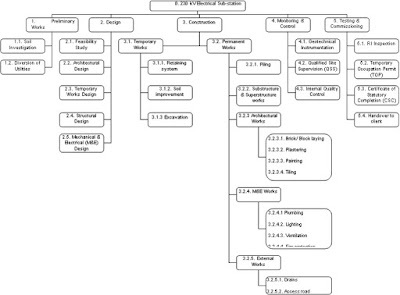 A sample, simplified version of work breakdown structure (WBS) is shown below for a construction project. You can create similar work breakdown structure in software project management or any other project you are working on. The WBS components represent verifiable products, services or results. The WBS include all product and project scope, including the project management work. The WBS should ensure that all necessary work is performed, but no extra work is performed. This is known as the 100 percent rule. The WBS provides the relationships among all the components of the project and the project deliverables. The WBS provides a structured depiction of what has to be delivered by the project. The WBS dictionary provides detailed information about the deliverables and a description of the work for each work package in the WBS. It might include details like unique identifier, description of the work to be done, assumptions, constraints, acceptance criteria, person or unit responsible for delivering the work, milestones, etc. The development of WBS dictionary helps in identifying any missing information or errors in WBS.